Catharine Parr Traill immigrated to Upper Canada in 1832. She was an author, botanist, and pioneer in early Canada during the nineteenth century. She provided richly detailed descriptions of early pioneer living that enlightened our understanding of what it took for survival. Life was a challenge for Catharine and her family in Upper Canada which she documented and shared openly through hundreds of letters to family and friends and through dozens of books. 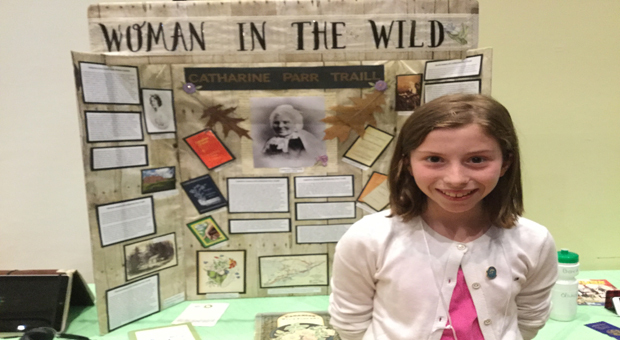 Catharine Parr Traill's written contributions are important sources of early Canadian history. She taught us about survival, values, botany, overcoming obstacles, the importance of a strong work ethic, and believing in one's own inner strength. Quintyn represented Kingston at the Ontario Provincial Fair in Toronto.